My mailbox is getting all kinds of action this week! Today? This! 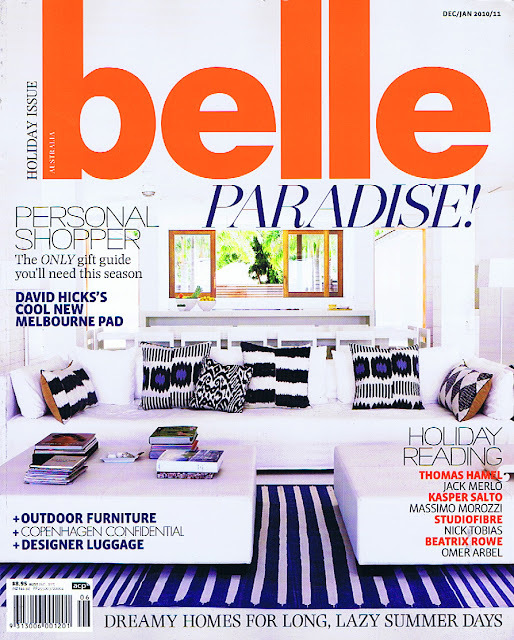 The December-slash-January-2010-slash-2011 issue of my current fave*, Belle. Brids...It's ABSOLUTELY my fave, and you know why! If only we could * our life heh!! THANKS big time for today. With kindy/school pickup I didn't make it to get a copy - but will tomorrow. I danced for the entire afternoon. love this blog. so great, so happy I found it!!!!!!! Mamma mia what a cover! Loving everything in that picture and have a serious crush on blue/white combos at the moe. Have a spooky and fun weekend in the new house my dear! We need to tee up that coffee soon ok.
Hugs from the Eastern burbs. oh nice! i wish i could find it here in scandinavia... maybe time to go hunting in international magazine stores!